Hello again and happy new year to my visitors! It’s great to be back and crafting again after a wonderful but hectic Christmas and New Year time. We had a great Christmas. Hope you enjoyed yours! The kids were so excited to open their presents – hearing their squeals of delight was priceless (although 5.50am might have been a *little* early for squeals). 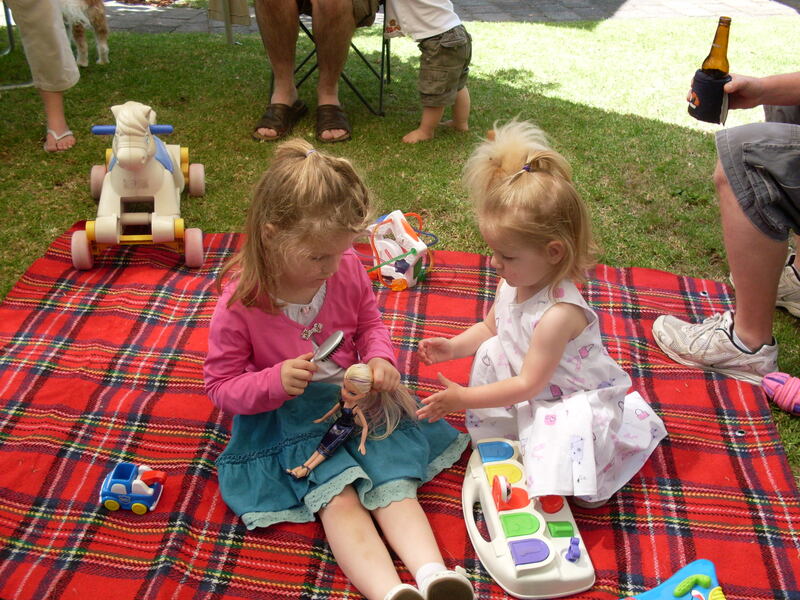 We went to Mum and Dad’s on Christmas morning, and spent the day there with family. Mum put on an amazing feast for us all – she’s truly amazing. Highlights for me were watching the kids opening their family presents outside in the beautiful sunshine, spending time with my sister and her gorgeous boys, and the walk we all went on after lunch. Our stamp club for January was held on Friday. It was so lovely to see all the ladies again and to spend a bit of time stamping together. We did the Emerging Colour technique (above), using inks, the All In The Stars stamp set, clear embossing powder and the brayer. To finish up they all stamped a 2009 calendar bookmark. Now a new month and a new Year brings lots of new treats from Stampin’ Up! Do you have a copy of the Sale-a-bration brochure? Shoot me an email and I’ll get one in the post to you. Today is the birthday of a wonderfully talented stamper and friend who I’m very proud to say is one of my team members. I wanted to make her a special card, but I took so long making it that I didn’t send it early enough and I suspect it got caught up in all the Christmas mail. Happy Birthday Maureen! On this card I’ve used the Infinite Goodness stamp set (free Level 2 hostess set) and Curvy Verses, watercolour paper and the Rose Red Prints Designer Series paper. The new 1" wide double-stitched Rose Red ribbon features here, which is only available in the current Summer mini catalogue (p20). I love using Rose Red so it’s wonderful to have a ribbon that matches the cardstock, paper and ink perfectly. Layered on top is the moss tafetta ribbon, which unfortunately doesn’t photograph too well but looks great in real life. The large scallop rectangle was made with the Scallop Edge punch. I followed this great tutorial to match up the scallops so there is one in each corner of the layer. It was fun to make something non-Christmasy, even though I looooove this festive time of year. Two more sleeps until Santa’s here! Well, the cards are (finally!) done and sent, pressies bought and wrapped so now it’s time to sit back and enjoy Christmas. Yaaaay. Yesterday I spent the day cooking with the kids. They got to pick all their favourite foods and we had so much fun – and made a huuuuuge mess, but hey that was half the fun. Cupcakes, fruit pies, choc-dipped fruit and more. I even found some time to decorate this little ‘double-pocket bag’ that my friend Keah showed me how to make. 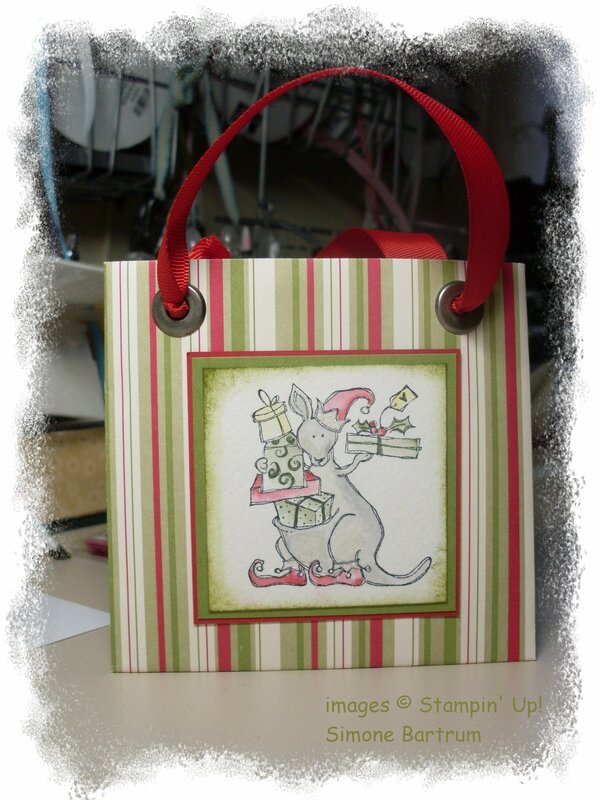 I decorated the front with the ‘roo from Happy Christmas Mate, using Real Red and Old Olive cardstock and ink to tie in with the stripes on the Dashing designer series paper. It’s the perfect size for a gift voucher and matching gift card. Hope you have a safe and very merry Christmas, and enjoy the festive time spent with those we don’t see often but especially those we see and love every day. It’s that time of year when the kids are finishing up school and kinder, and all their other activities, and there are lots of people to thank. This year I’ve had fun making Christmas Tree ornaments out of the wonderful scallop punch, a couple of circle punches and yummy peppermint cream chocolates from Cadbury’s sandwiched in the middle. They make fun little treats and look great when done up in a gift box. 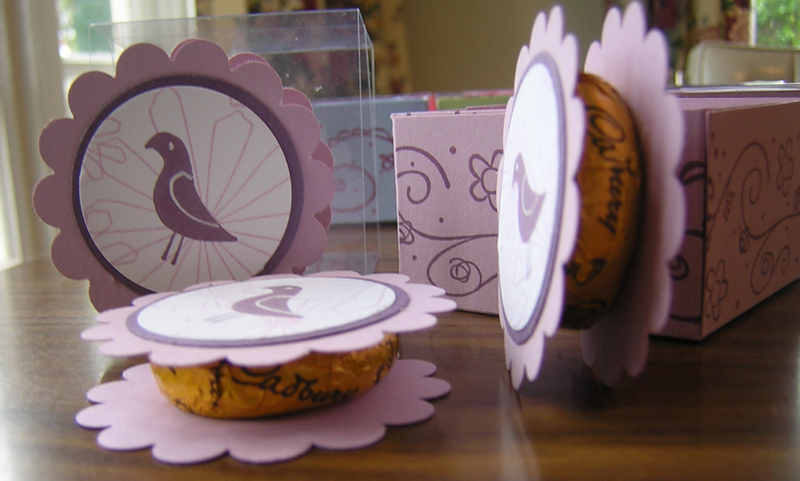 These are acetate ‘matchboxes’ I made for the girls in my Stampin’ Up! group at the recent Melbourne Regional training day. They perfectly fit 3 of the Peppermint Cream Sandwiches inside. The slide-off ‘lid’ is made from clear acetate sheets (similar to overhead transparency sheets) which are available from office supply shops. This one (above) features the Level 2 Free Hostess Set Spring Solitude – now that is one understated stamp set! When I first saw it I thought ‘not me’, but it has really grown on me. With any of the 2 Step stamp sets it takes a little more effort to see their potential, because it’s not immediately obvious what you can do with it, but let me tell you this is one great little versatile set! Colours: Pale Plum, Perfect Plum. 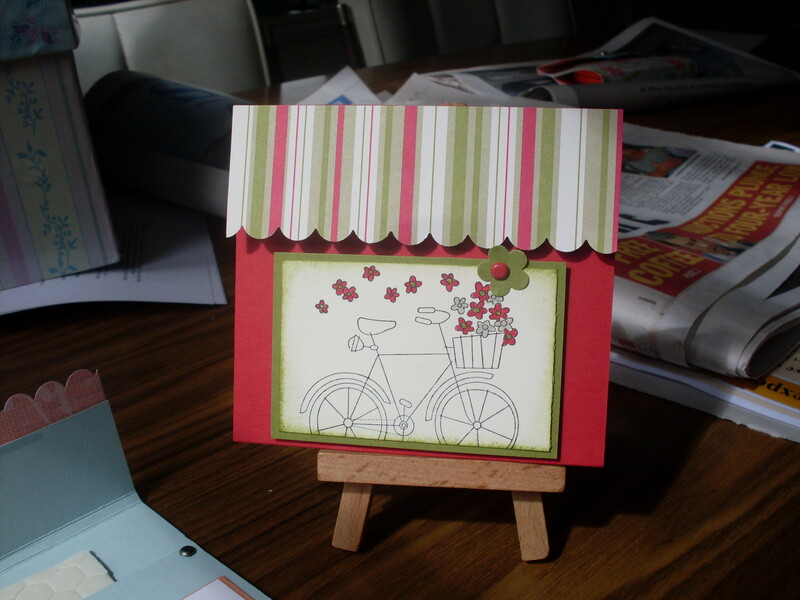 Here are some more projects using beautiful new stamps and Designer Series Paper from the Summer Mini Catalogue. 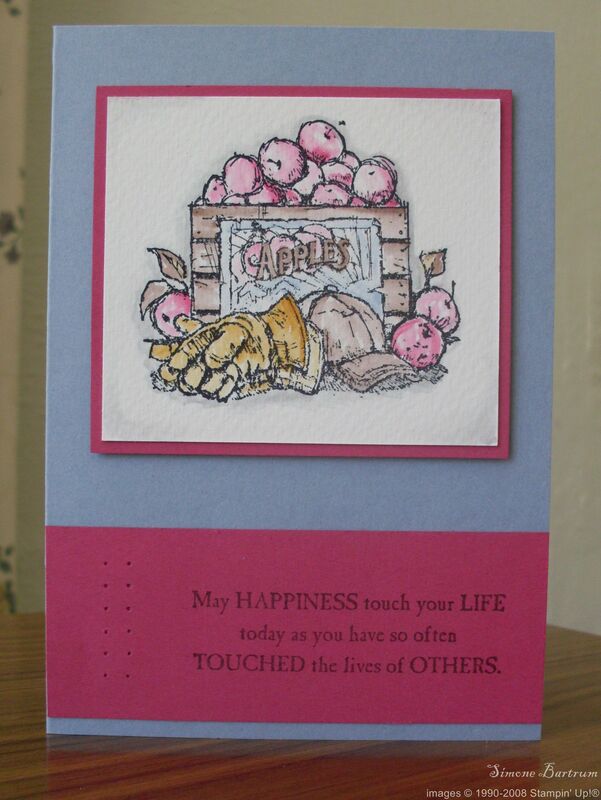 Above is Ginger Blossom DSP and the lovely Embrace Life stamp set (p19). We made these popular little “Bags in a Box” at Stamp Club this month. The card above is my submission for this month’s EurekaStampers challenge. Juliana challenged us to make a project with a stamp set and coordinating Designer Series Paper from the Summer Mini Catalogue. 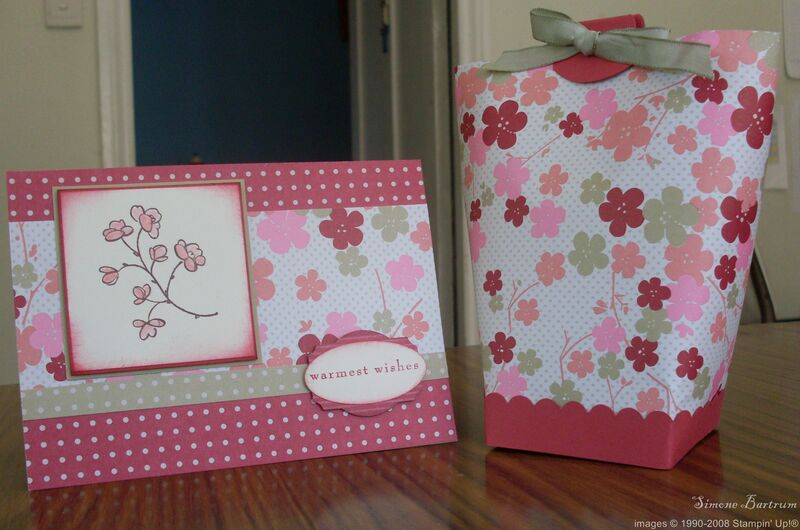 My version uses Eastern Blooms stamp set with Regal Rose and Choc Chip ink, and the Bali Breeze paper. The card base is Old Olive. 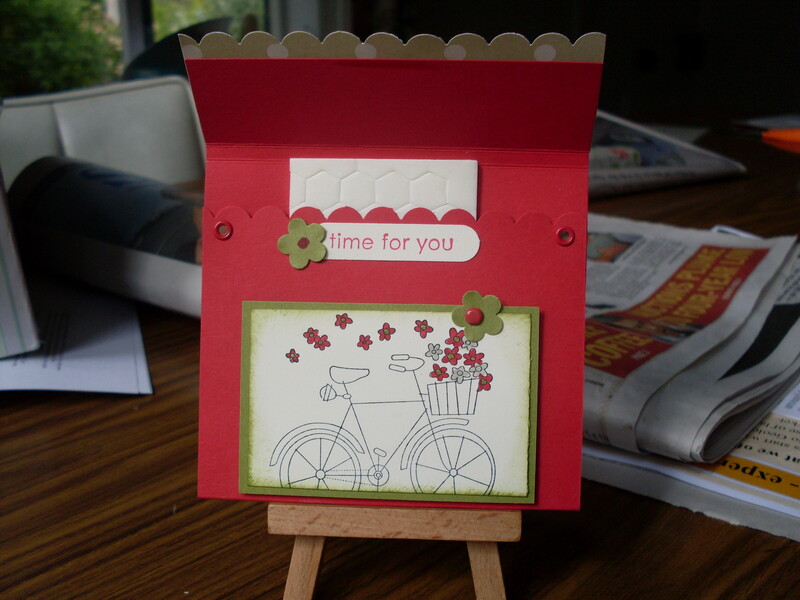 This final card was another of our December Stamp Club projects. The ladies loved Stampin’ Up!’s beautiful watercolour paper – it’s divine to work with, and almost impossibe to make a ‘mistake’. But hey, as I always say there’s no such thing as a mistake, only an opportunity for embellishment. The card features the For Father stamp set, coloured with markers and a blender pen. Colours include Bordering Blue, Rose Red, More Mustard, Close to Cocoa, Choc Chip and a couple of shades of gray! During these crazy December days, it’s nice to stop and take a minute out for you! Sometimes it seems that all we do is race around after other people! Believe me, I know. I was thinking of this when I made these pocket cards for some stamping friends. They feature stamps from the sweet new Time For You set (p12 Summer Mini catalogue). Inside are some foam dimensionals, but you could just as easily pop a gift card in there. The scallop edge along the strip of Dashing designer series paper is made with the great new Scallop Edge punch, straight out of the brand new Summer Mini catalogue. Very handy indeed! !